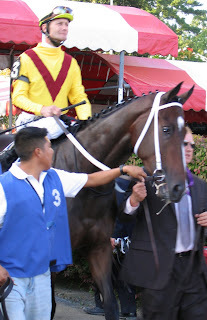 I can get pretty emotional about horses, but I surprised myself when I got choked up as soon as I caught sight of Rachel Alexandra coming toward me as she walked down the path toward the Saratoga racetrack, taking the first steps toward what would be her historic victory in The Woodward Stakes. Her unprecedented win was hard fought, and well-earned. She set the pace and ran the first quarter of the nine furlong test in a seemingly suicidal 22 and change. Uh oh, I thought. That's too fast. I feared that having spent herself so early in the race, the super-fast filly would run out of gas by deep stretch, when I knew that a gang of older horses would be coming to get her. But she repelled one challenge, and then another, and then finally, when the gray Macho Again came barreling around a wall of horses like a relentless freight train, I held my breath. So did the other 31,000 spectators, I think. But if Rachel Alexandra was tiring, she wasn't quitting. Her class and her heart kicked in, buttressed by her ultra-efficient cardiovascular system and superior biomechanics. And she held on by the shortest of necks to win her ninth consecutive race, her fifth Grade I contest, and her third against the best male horses in the nation. I burst into tears the minute I realized that she'd really prevailed, overcome with emotion and awed by the filly's sheer greatness. Her trainer, Steve Asmussen, later unashamedly confessed that he was, too, "I cried," he said. "I've never cried at a horse race. It moved me." Rachel Alexandra's got nothing left to prove, and I hope that it's true that her people may now decide to give her the rest of the year off, as they have said they may do. She's already clinched Horse of the Year honors, and will forever have a cherished place in our hearts, and in history.